An infinite plane problem with a circular boundary under the screw dislocation is solved by using a new method. The angle-based fundamental solution for screw dislocation is expanded into degenerate kernel. Our method can explain why the image screw dislocation is required. Besides, the location of the image point can be obtained easily by using degenerate kernel after satisfying boundary conditions. Even though the image concept is required, the location of image point can be determined straightforwardly through the degenerate kernel instead of the method of reciprocal radii. Finally, two examples are demonstrated to verify the validity of the present method. The dislocation theory is essential for understanding many physical and mechanical properties of crystalline solids. Many researchers investigated the dislocation problems in the past years. Smith  successfully solved the problem of the interaction between a screw dislocation and a circular or elliptic inclusion contained within an infinite body subject to a uniform applied shear stress at infinity by using the complex-variable function and circle theorem. Dundurs  solved the screw dislocation with circular inclusion problem by using the image technique. Later, Sendeckyj  employed the complex-variable function in conjunction with the inverse point method to solve the problem of the screw dislocation near an arbitrary number of circular inclusions. Almost all above problems were solved by using the complex-variable technique. Its extension to three-dimensional cases may be limited. A more general approach is nontrivial for further investigation. In the potential theory, it is well known that the image method can solve potential problems when the fundamental solution is known. 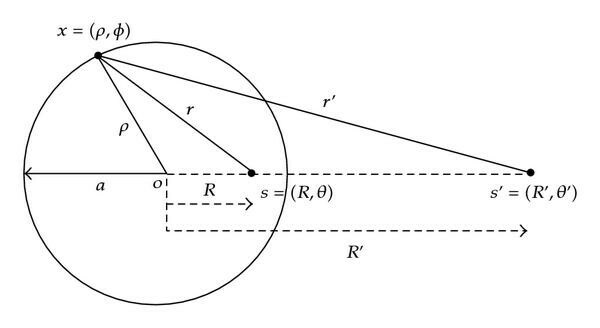 The image point was found in a semi-inverse method a priori through the reciprocal radii in the Sommerfeld's book  as shown in Figure 1. Sommerfeld and Greenberg  both utilized the concept of reciprocal radii of Thomson  to derive the Poisson integral formula. It is important to find where the location of image point is. However, we do not find a natural and logical way about how to determine the location of image point in the literature until an alternative way proposed by Chen and Wu . Chen and Wu derived the location of image point for a source singularity in a straightforward way through the use of degenerate kernel and proved an alterative way to derive the Poisson integral formula. The fundamental solutions of source singularity are expanded into degenerate kernels for constructing the Green's function. Since the degenerate kernel separates the source and field points for the closed-form fundamental solution, it plays an important role in studying the image location [8, 9]. To determine the location of image point for screw dislocation in a straightforward way is the main concern of the present paper. In this paper, we will introduce the degenerate (or so-called separable) kernel for the angle-based fundamental solution ( ) for the screw dislocation instead of radial-basis one ( ) for the source singularity. By employing the degenerate kernel, the closed-form Green's function is expanded into the degenerate form. Also, the location of image point is found in a straightforward way. The two-dimensional Laplace exterior problems are solved. Finally, two examples were given to demonstrate the validity of the present method. Sketch of the concentrated source and the screw dislocation. where the superscripts and denote the interior and exterior cases, respectively. It is noted that the denominator in (2.5) involves the larger argument to ensure the series convergence. The displacement contour of the screw dislocation in the four quadrants by using (2.5) is shown in Figures 3(a)–3(d). When the screw dislocation locates at the four quadrants, there are certain areas falling outside the range between and . We subtract , where the value is greater than to ensure the value in the range. Similarly, we add , where the value is smaller than . 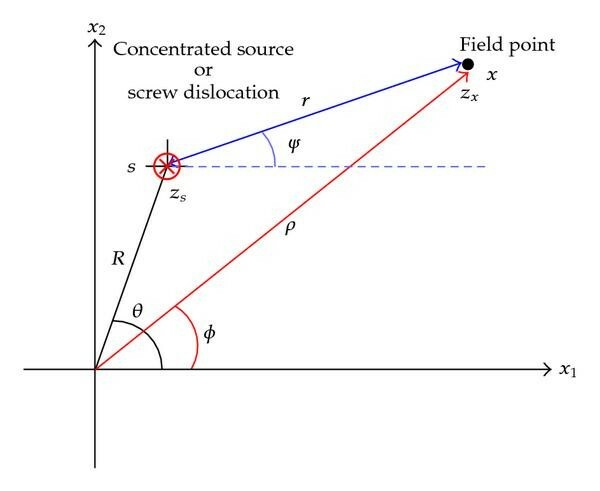 When the response falls in the defined range, Figure 4 shows the displacement contour for the screw dislocation. To the authors' best knowledge, the degenerate kernel for the angle-based fundamental solution was not found in the literature. Screw dislocation in the first quadrant after modification ( , ). 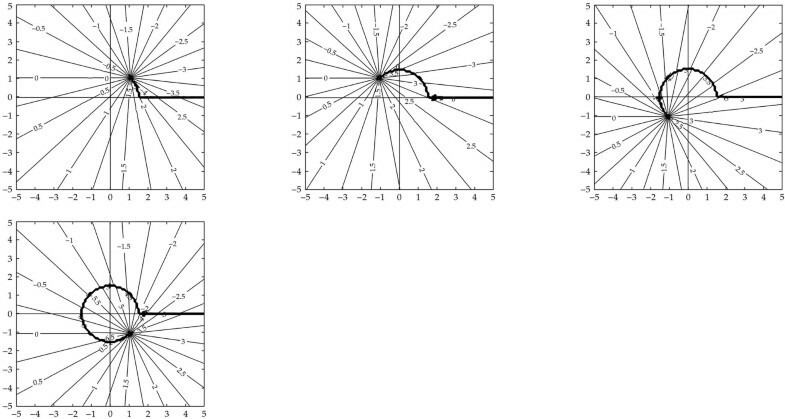 2D exterior problem (a) Dirichlet boundary condition and (b) Neumann boundary condition. Green's function of (a) the inner domain ( ) and (b) the outer domain ( ) for the exterior problem. where and denote the complex function and shear modulus, respectively, denotes the conjugate of the position vector of the screw dislocation, and denotes the real part. Figures 7(a) and 7(b) show the contour of displacement field by using the Smith's method  and the present approach, respectively. Good agreement is made. Displacement contour (Dirichlet boundary condition) by using (a) the Smith's method  and (b) the present method ( ). Figures 8(a) and 8(b) show the contour of displacement field by using the Smith's method  and the present approach, respectively. It is found that the result of the present approach is acceptable. 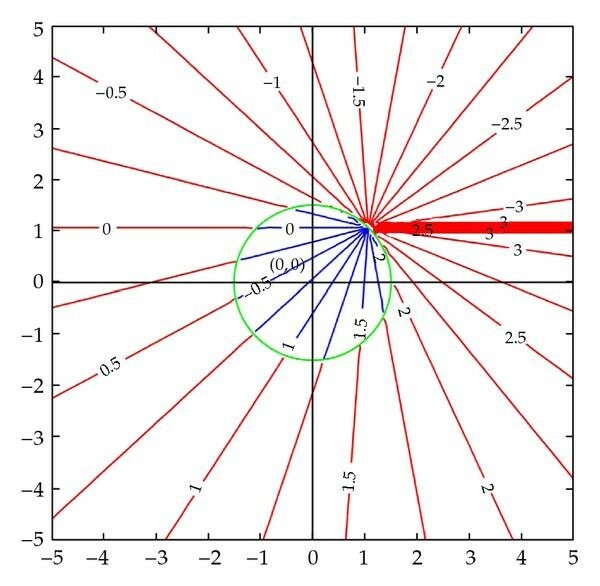 Based on the image method, it is a straightforward, logical, and natural way to find that the location of image point is ( ). We summarize the result of our approach for the screw dislocation and compare with those of Chen and Wu  for the source case in Tables 1 and 2. Comparison for the source or sink and the screw dislocation (Dirichlet B. C.). Comparison for the source or sink and the screw dislocation (Neumann B.C.). Displacement contour (Neumann boundary condition) by using (a) the Smith's method  and (b) the present method ( ). For the screw dislocation problem with circular boundaries, we have proposed a natural approach to construct the screw dislocation solution by using the degenerate kernel. The angle-based fundamental solution for screw dislocation was derived in terms of degenerate kernel in this paper. Based on this expression, the image location can be determined instead of using reciprocal radius. Two examples, including an infinite plane with a circular hole subject to the Dirichlet and Neumann boundary conditions, were used to demonstrate the validity of the present formulation. The financial support from the National Science Council under Grant no. NSC-98-2221-E-019-017-MY3 for National Taiwan Ocean University is gratefully appreciated. Thanks to Mr. S. R. Yu for preparing the figures.